In March of this year, BGLH broke the story on the proposed U.S. Army Regulations (AR 670-1) and the subsequent disparate impact on women with natural hair in the Service. As the issue gained traction among ladies of all backgrounds, articles, petitions, letters, and forums dedicated to calling out the discriminatory nature of the regulations emerged. The Congressional Black Caucus even got involved. 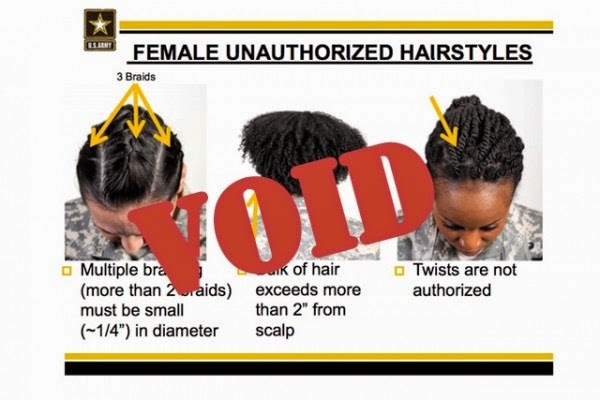 In a letter to Rep. Marcia Fudge (D-Ohio), Chair of the Congressional Black Caucus, Defense Secretary Chuck Hegel disclosed that the military had spent the past three months reviewing the definition of what styles are deemed acceptable. "Each Service reviewed its hairstyle policies to ensure standards are fair and respectful while also meeting our military requirements. As a result of these reviews the Army, Navy, and Air Force determined changes were necessary to their Service grooming regulations to include additional authorized styles. These reviews were informed by a panel of military personnel of mixed demographics reflective of our diverse force." Translation: they asked some Black people. 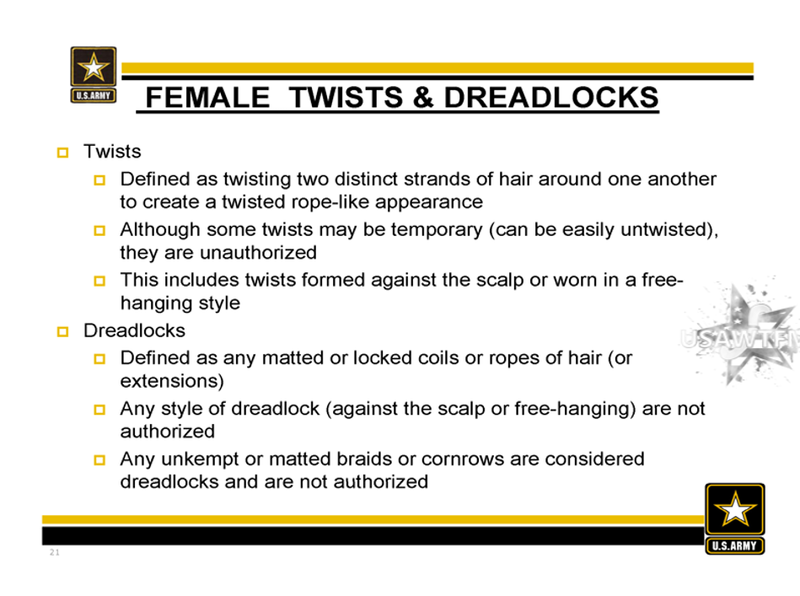 All three branches have authorized two-strand twists as acceptable styles, and the Army has increased the size of what braids are deemed "acceptable". Both the Army and Air Force will removed the pointed and offensive language "matty and unkempt" from their guidelines. The Marine Corps have not quite signed off on the reversal, opting to have a working group of the Uniform Board open a survey to all Marines to provide feedback on whether the twists and locs should be allowed. A final decision will be made after the survey closes August 15th (today). The only Service entity to approve locs as acceptable is the Coast Guard, which could be the beginning of a trend -- but at this time there is no word that the Army, Navy, Marines, or Air Force will be taking that step. "These changes recognize that traditional hairstyles worn by women of color are often necessary to meet our unique needs, and acknowledges that these hairstyles do not result in or reflect less professionalism or commitment to the high standards required to serve within our Armed Forces. With these changes, Secretary Hagel and the Department of Defense not only show that they are responsive to the individuals who serve within our military, but that he and his leadership respect them as well. The Congressional Black Caucus commends Secretary Hagel for his leadership in addressing the issue." Although the White House petition started by Sgt. Jasmine Jacobs garnered just shy of 18,000 signatures, the outrage across social media and other avenues online was more than enough to command attention and affect change. While I am ecstatic over our ability to collectively turn the tide regarding decisions that disproportionately impact us, the fact that it took over three months for the Department of Defense to push the legislative equivalent of Ctrl+Z is troubling. It highlights a serious lack of diversity and cultural competency in areas of decision-making for all branches of the Service. If the "mixed demographics" were at the table before AR 670-1 rolled out, AR 670-1 would have never been released the way that it was. Yes, it is only hair. Yes, there is a need for certain parameters around uniformity and appearance of soldiers. No, women with natural hair are not forced to serve. But at the end of the day, these brave women make a conscious decision to sacrifice themselves for their country. The least that could be done is to not insult them while they're doing it. Are you satisfied with the DOD's response, or nah? Thank you so much for the follow up on AR 670-1. Well written follow up on this hair policy. I couldn't believe how racist and discriminatory this policy was considering the large number of black women serving honorably and proudly in the Armed Forces. Yet another perfect example of institutional and systematic racism. I'm proud of all of those fighting courageously and bravely against this racist policy. It's a small victory. Now we should fight about school and businesses discriminating against natural black hair.